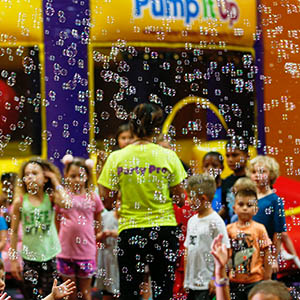 With our Bubble Mania experience, your birthday child and his/her guests will have the time of their lives chasing and popping thousands of bubbles swirling around our play area. Includes 10 minutes of bubble machine operation. 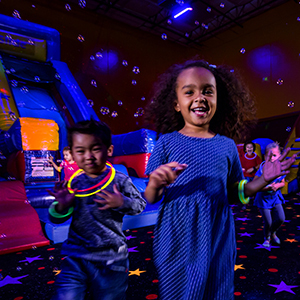 Our Glow Wars experience is a real blast for both boys & girls! It includes the use of our glow-in-the-dark ball guns all under Glow lighting. Every child receives a glow necklace as well (up to 25). Pump It Up party attendants lead fun games with the kids using the ball guns. The kids and parents are easy targets and the soft pong balls glow in dark as they soar through air. For your next party, surprise your little one with a fun Glow Wars party! Take your party to a whole new level by adding a themed character appearance to your party. Choose your child’s favorite cartoon or movie character and watch your child’s face light up when he/she sees them! We have a big selection of characters, from PRINCESSES to SUPERHEROES and CARTOON and MOVIE CHARACTERS. The character(s) will make an appearance at your party, take photos with the kids, interact with them and play games. Includes 30 minutes for one character. 10% Discount on 3 characters or more. This experience is a customer favorite! 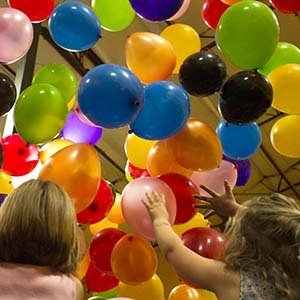 It includes over 150 balloons dropping on your birthday child and his/her guests. Kids can play with balloons and take them home if they wish. Our artist will decorate each child’s face with cute and colorful designs to match their personality. These awesome decorations will make your party pictures even more fun! Face painting is fun and definitely one of our most popular party activities. Kids love having their faces painted because it is a fun way to "dress up" - no costume required! Add GLITTER TATTOOS to enhance this party experience for an additional $25 (includes 15 tattoos). $1.25 extra for each tattoo after 15. Don't have time to make goodie bags? No worries, we'll make them for you! Add a custom sticker or tag for $1 extra per bag. Enjoy the party while our Party Pros take pictures throughout your party. We'll put all the photos in a CD for you, and you can share and/or print them.